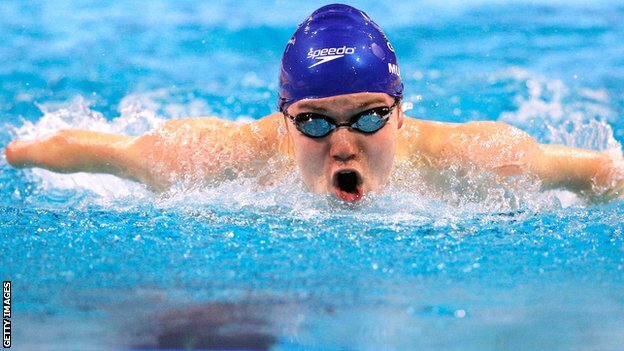 Scottish swimmer Andrew Mullen claimed his second IPC Swimming European Championship title in less than 24 hours in Eindhoven. The 17-year-old Glaswegian won the SM5 200m individual medley in a personal best of three minutes 6.78 seconds. It followed Wednesday’s European record-winning S5 50m butterfly swim. “From having no international gold medals in three years to two in the space of 24 hours is quite amazing,” he told BBC Sport. Mullen won the medley with an improvement of more than two seconds on his previous best of 3:08.64, and he beat the rest of the field by more than 12 seconds. “I was hoping to do well here. Training had been going well and I’m really happy to be racing – it’s what I enjoy doing best,” he added. Mullen, who was born with only one limb fully formed, also paid tribute to the achievements of the Scottish team, especially the swimmers, at the Glasgow Commonwealth Games. “Ross Murdoch’s win in the 200m breaststroke got me fired up to race so I have to thank them,” he said. Also on Thursday morning, Rob Welbourn qualified second fastest for the final of the S10 400m freestyle, which will take place on Thursday evening. Sascha Kindred and Ellie Simmonds will be in action, respectively, in the men’s and women’s SM6 200m medley finals.